Big opportunity: For every $1 in digital video ad spend, there is $5 of traditional TV spend that is still targeted to age/gender. 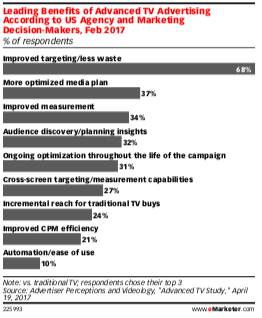 68% of advertisers cite improved targeting/less waste as a leading benefit to advanced TV advertising. More audience spend: Turner is pushing advertisers to increase their advanced TV spend to 5%.